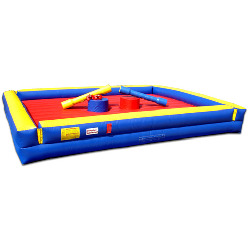 The Gladiator Joust is a large inflatable arena where two opponents attempt to keep their balance on foam pedestals as they swing foam jousting sticks at each other. It is just as competitive as it is comical. The pedestals are placed just far enough apart that you have to reach a little, and yep, that's usually when your friend smacks you with the joust stick sending you directly into the inflatable floor laughing. The Gladiator Joust is a game of strategy and balance, but sometimes it's just as fun to get up, swing like crazy, and fall a lot. This inflatable rental is another example of a popular, crowd pleasing interactive game.